This hardness tester comprises the very best in “state of the art” design along with dynamic precision only found at Phase II. The 900-331 Rockwell scale hardness tester is easy to operate, yet engineered to obtain highly sensitive and accurate readings. 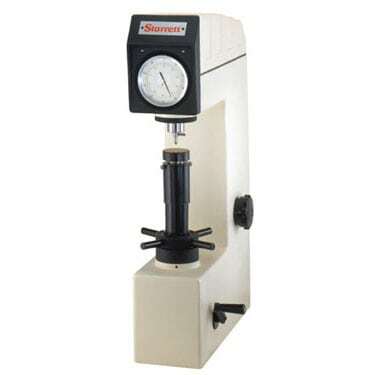 Conforming to ASTM E-18 Rockwell Hardness standards, the 900-331 tester will offer unmatched repeatability in all standard Rockwell Hardness scales (table shown below). A perfect, rugged performer suited for any environment including heat treat facilities, tool rooms, workshops, laboratories and inspection labs. 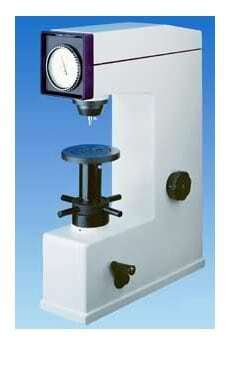 Lifetime technical support is included on all Phase II Hardness Testers. So test away with confidence and a level of accuracy you will only find at Phase II. Since 1984, United has manufactured computer-controlled closed loop Hardness testers. Our second generation Hardness tester, the Tru-Blue II is the lowest priced US manufactured closed loop tester that meets ASTM E18, ISO 6508 specifications and NIST recommendations. The Tru-Blue II comes standard with a Direct certification of the hardware calibration with NIST traceability and a factory one-year indirect calibration for customer specified hardness testing scales. The tester can be put into operation without the need for an additional on-site calibration or manufacturers assistance! Having no dead weights, pivot points and knife edges to move out of adjustment, the Tru-Blue II can be moved to a new location without having to be re-calibrated. When mounted on United’s optional mobile stand, the Tru-Blue II is transportable to different locations. Test Forces in Kg. :2, 2.5, 4, 5, 6.25, 7.8125, 10, 15.625, 20, 30, 31.25, 40, 62.5, 100, 120, 125, 150, 187.5 and 250. Direct reading of one Brinell range. Test Forces in Kg: 3, 5, 10, 30, 50, 100, and 120. Direct reading of one Vickers range. Rockwell, Brinell and Micro hardness test blocks: All test blocks come with a certification sheet containing all the necessary calibration information. Rockwell diamond indenters: Scales A, C and N. All diamond indenters come with certifications. Heavy load Vickers and Micro hardness diamond indenters: ¼ , 7mm and 8mm shank sizes and Tukon. Anvils and support devices: Spots, flats, “V”, Vari and Jack rests. Additional accessories: 2 inch roll mini serial and parallel printers, stationary and mobile stands, foot switch to activate test cycle, mini PS/2 keyboard. B Ball 1/16″ (1.588mm) 98.07 (10) 980.7 (100) Copper alloys, soft steels, alum. Alloys, malleable iron, etc. This hardness tester comprises the very best in “state of the art” design along with dynamic precision only found at Phase II. The 900-331 Rockwell scale hardness tester is easy to operate, yet engineered to obtain highly sensitive and accurate readings. Conforming to ASTM E-18 Rockwell Hardness standards, the 900-331 tester will offer unmatched repeatability in all standard Rockwell Hardness scales (table shown below). A perfect, rugged performer suited for any environment including heat treat facilities, tool rooms, workshops, laboratories and inspection labs. This “NEW” hardness tester combines our best selling 900-331 rockwell hardness tester with our new 9500 series digital indicator upgrade. This brilliant combination gives you the very best functions of a digital Rockwell hardness tester yet has the ease of use of our analog hardness testers. Conforming to ASTM E-18 Rockwell Hardness tester standards, the 900-331D hardness tester will offer unmatched repeatability in all standard Rockwell Hardness scales (table shown below). A perfect, rugged performer suited for any environment including heat treat facilities, tool rooms, workshops, laboratories and inspection labs. Automatic conversions to Brinell, Vickers, etc. 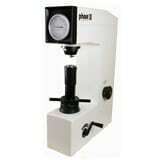 Conforms to ASTM E-18 Perfect for laboratories, workshops, tool rooms, inspection labs, etc. This digital Rockwell hardness tester with fully automated load/unload procedures affords highly sensitive and accurate readings. Micro computer controlled with USB output to built-in mini printer or PC. The 900-365 digital Rockwell hardness tester offers programmable scale conversions, dwell times, statistical capabilities and test counter. Capable of testing in all of the regular Rockwell® scales. Automatic conversions to: HRN, HRT, HB, HV, HLD and σb. The 900-365 digital Rockwell hardness tester comes complete with everything needed to test in the following Rockwell Scales: A, B, C, D, F, G.
Other Rockwell Scales can be achieved with optional indentors! 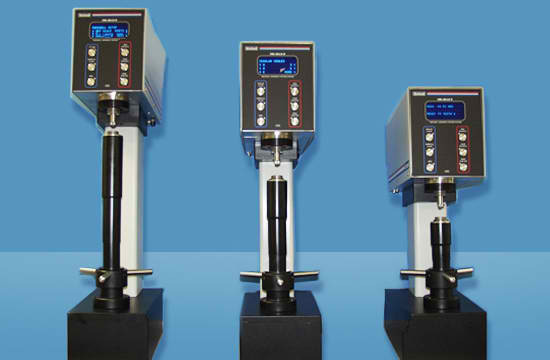 Conversions: The 900-365 digital Rockwell hardness tester can convert the measured Rockwell hardness value to other scales or even tensile strength. Example: the value of HRA scale can be automatically converted into HBS, HBW, HV and HK value; Convert the value of HRB scale into HB10, HB30, HV, HLD, σb and HK value; Convert the value of HRC scale into HBS, HBW, HV, HLD, HR15N, HR30N, σb and HK value; Convert the value of HRD scale into HV, HK, HB value; Convert the value of HRE scale into HV, HK, HB value; Convert the value of HRF scale into HV, HB value. Scale conversion, HV, HB, σb, etc. Prior to ship, please advise power setting needed.